In an effort to celebrate Hispanic authors beyond National Hispanic Heritage month, I plan to read and post about YA novels written by Latino/as. You may also want to check out Latina Book Club, Vamos a Leer, and The Hispanic Reader. And, today’s YA author in the spotlight is: Cristina García . Enjoy! AUTHOR: (information comes mostly from the author’s website (http://www.cristinagarcianovelist.com/): Born in Cuba, García’s family moved to New York when she was two years old. García worked as a journalist for Time Magazine before she became a full-time writer. Her first novel, DREAMING IN CUBAN, was a finalist for the National Book Award. Among other things (she has a long list of accomplishments), García has written five novels for adults and three books for younger readers: DREAMS OF SIGNIFICANT GIRLS, I WANNA BE YOUR SHOEBOX, and THE DOG WHO LOVED THE MOON. She has a bachelor’s degree in political science from Barnard College and a master’s degree in European and Latin American Studies from The Johns Hopkins University. DESCRIPTION FROM THE BOOK JACKET: Three very different girls. Three very different summers. A powerful bond that stands the test of time. Vivien struggles with her identity. She doesn’t exactly fit in with the kids in her neighborhood. To top it off she worries about her expanding waistline and endlessly infuriating family. Shirin is an Iranian princess and honestly believes she is better than everyone else. She has no time to suffer fools. Ingrid has never followed the rules. It is easier for her to rely on herself and grow up way too fast. She is not in the business of showing how she feels, but that isn’t always easy when you never get what you want. National Book Award Finalist Cristina García weaves a story of first loves and hates, the heartbreak of being disappointed by your parents, finding what you are good at, and the realization that family is more than sharing a last name. Here is a review of the novel in the New York Times by Veronica Chambers. MY TWO CENTS: This is a quiet novel. No explosions every few chapters, no governments being overturned or alien invasions averted. Yet, what happens to these girls is significant because the moments they experience are crucial to their personal development. The gentle pace of this novel won’t appeal to everyone, but I enjoyed getting to know these characters and taking a break from action-driven YA. I had some questions about character motivation along the way, but overall, I was attached to these girls as they experienced the pain and joy involved in friendships and first loves. I wanted to find out what would happen to them. 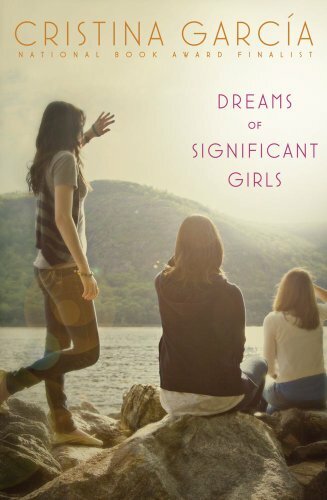 Find DREAMS OF SIGNIFICANT GIRLS on Amazon.com, Barnes and Noble.com, IndieBound.org, and Goodreads.